Bear is becoming a bit of a fussy eater. He likes to throw his food on the floor rather than eat it and he loves eating bits of unidentified stuff off the floor. I wistfully think "If only I could make the stuff and make it nutritious and healthy!" So I have been trying to find ways of getting him to eat more, especially fruit, and one of these was smoothies. He loves them but they won't go through his sippy cup and any other way ends up being so messy. Hands in cups, cups flung across the room, you get the picture...total nightmare. Then one day, when he was being particularly fussy, I gave him a pouch of pears, pears, pears. He ate it straight from the pouch! I thought pouches would be great for smoothies and looked for reusable pouches. I decided on the Squeeze Please Reusable Pouch. They were exactly what I was looking for and had good reviews too. 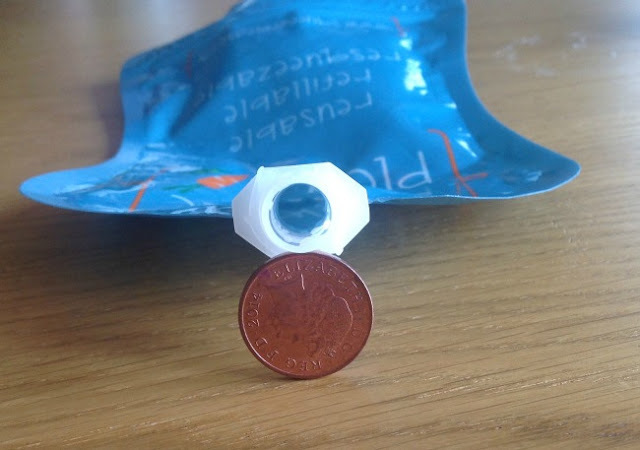 I bought mine from Amazon and they cost £10 for a pack of 3. The Squeeze Please reusable pouch was larger than I expected, the size is clearly described on the website but I'm not so good at imagining 28 x 15.4 x 1.4 cm! The size isn't a bad thing though. Great for little hands and space for us to help with a squeeze or to roll it up to get the last drop. They hold about 200 ml. Bear loves yoghurt and he can eat a whole one from this pouch in seconds, with no wastage. 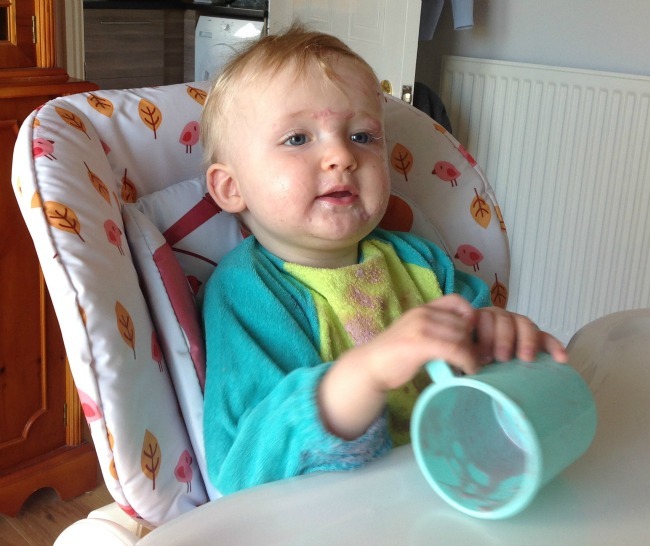 Using a spoon and bowl takes ages and he gets most of it in his hair, on his hands, his bib or his face. They have a large hole in the spout so bits can easily go through but this does mean that if he squeezes when its not in his mouth it would go everywhere! Squeeze Please describe the pouches as reusable, portable, convenient and safe. The pouches are zipper-sealed at the bottom so they can be filled with anything squishy like smoothies, yoghurt's and homemade purées without leaking. Even when we squeezed the pouch none came out the bottom. When filling they do not stay open without squeezing the sides so if using thick foods like yoghurt it takes it two to fill, one to hold and one to spoon the food in. I'm still looking for something that would support the pouch whilst squeezing the sides. Pouch needs to be squeezed open to fill. Showing zipper seal. Just like ready filled pouches these are easy to take out when travelling or for older children for lunch boxes. They are quite flat and use up less space than jars and cans. They are lighter to carry too. 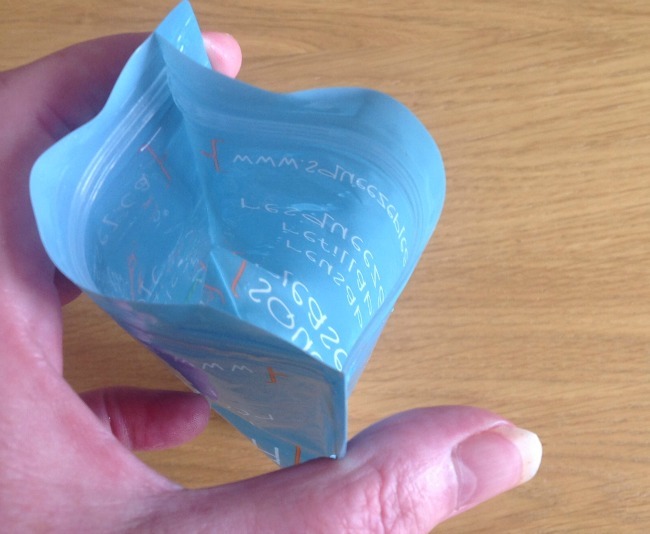 After use the pouches lie flat and can be rolled or folded. The pouches are easy to clean. I washed them with soapy water and a babies bottle brush. I also tried putting them in the dishwasher on the top tray without rinsing first. They came out clean with just one small speck of fruit from the yoghurt inside. I'm happy to wash by hand but would recommend if putting in the dishwasher, to give a quick rinse first. These pouches are also freezer safe. They are described as BPA-free, PVC-free, Lead-free, and Phthalate-free. They have a large choke-free cap too. I haven't tried any other reusable pouches so can't compare but I am very happy with these and compared to pre-filled pouches they are good value for money. They are ideal for smoothies and yoghurt. For younger babies they would be great for homemade purées too. nice to see an honest review. 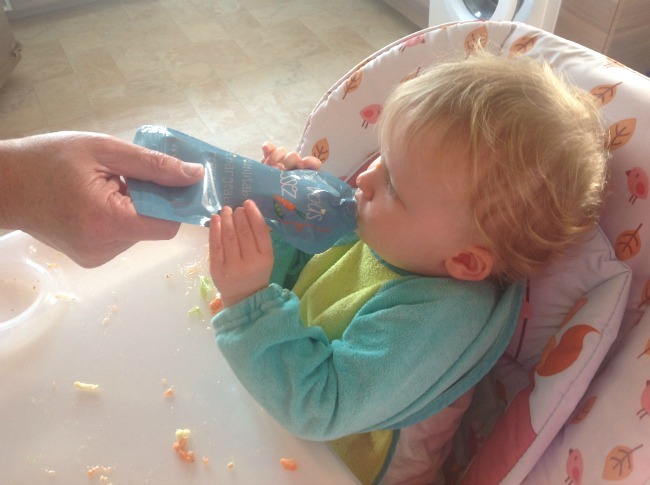 I know my daughter used pouches when out and about in the car as if they were hungry they could eat something as they found solid food frustrating as they were often too hungry to want solids when younger . They were both breast fed and so a bottle was not an alternative. Fifi's job was to sit in the middle and give them their pouches if need be. Pouches are so easy but the pre filled ones are expensive. I wanted a cup that didn't spill but would let lumps out! Another thing I need to invent lol. I liked these because Bear liked them too! Why Are "Kids Meals" So Unhealthy and Boring? Naughty or Nice? Who are The Honest Parents? Bears First Birthday. Why No Cake Smash?